Few animals reign a landscape like the grizzly bear does the tundra, in my opinion. Grizzlies are absolutely awesome, in every sense of the word. Seeing one can be an amazing experience, even for those of us who’ve been fortunate enough to see quite a number of bears in our lives. Photographing in Katmai National Park is beyond words. I took my parents there this September; though reluctant to make that trip part of their journey, I was finally able to talk them into it. They both say how glad they are that we went, and how that was probably the highlight of their trip. We were also fortunate enough to see a few grizzlies in Denali National Park, even up relatively close (when we were in a shuttle bus, not hiking on the ground). 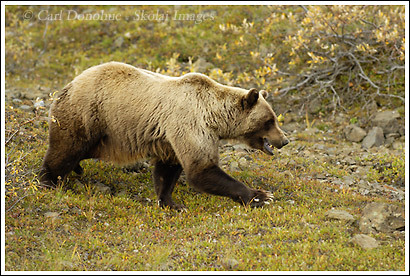 This grizzly bear photo I shot on my earlier trip to Denali, with my buddy Doug from Atlanta. Doug’s an old country boy from Georgia (“born ‘n raised!”), so seeing a grizzly bear was quite a thrill for him. Denali National Park can be a frustrating experience for the serious photographer, for sure; to be so close to so many wonderful opportunities, yet so often unable to shoot what you want because the buses don’t really accommodate photgoraphers very well has led a number of photographers to not return. On the other hand, it’s precisely because of those opportunities that makes Denali so appealing. There’s not too many other places you can see grizzly bears roaming the tundra like you can in Denali National Park. Generally, when I’m hiking and backpacking in places like Denali or the Wrangells, I don’t try to photograph grizzly bears. It’s simply not worth it. I don’t know the individual bears well enough, and bears, being bears, can often be unpredictable anyway. Even with a long telephoto lens, I still need to get reasonably close to a bear for decent photographs. 60 or 70 yards is about as far away as I can shoot from – MAYBE a little further if everything’s just right. The regulations for Denali National Park state that all hikers, backpackers, photographers, etc MUST be 300 yards away from bears, and maintain that distance, even if the bear approaches. 300 yards is too far away for photos. It’s still a huge thrill to see one, and I do get excited whenever a grizzly comes over the horizon. Brad and Don weren’t real impressed. Unsure of exactly what to do, I decided we best get up high again, and let the bear decide where he wants to go, and we’ll change our plans accordingly. We did, but it took maybe an hour or so of climbing and walking and hiking and watching and changing direction before we finally left him behind. It didn’t appear to me that the bear was particularly interested at all is us, or our food, rather he was just on a route that took him in a similar direction to ours. The expressions he gave us were beautiful; nothing untoward, simply a quirky wise old bear, knowingly in charge, yet willing to let us go on our way. I didn’t take a single picture of him. This entry was posted in Alaska, Denali National Park, Grizzly Bears, Wildlife on October 25, 2007 by Carl D.
That is a beautiful bear!! I’ve noticed that all of your photos’ of bears are really extraordinary. They show such expression of what that particular bear is feeling , maybe thinking , etc.. I love bears , as I do all animals. But to me , bears resemble man so much. They act in ways that are so like humans. They are so intelligent & so very unpredictable .So many people think they are cute & cuddly, which they are beautiful animals. But they can’t be trained like dog , even if you raise them all of their lives. They are called wildlife for a reason. Because they are wild and like humans have their own unique personalities. I’m very surprised Tim Treadwell lasted as long as he did. I feel great sympathy for he & his family, but what he did was extremely stupid. You cannot make ” friends ” with bears or any other wild animal. but they sure are a treat to observe! And you, Carl , do it so well!!! I know it’s a lot of work, but what a fantasic job! Keep up the awesome stories & pictures. Yes, bears are very cool.To watch them is always a treat. For them to allow us their trust and let us into their world is something we should be respectful of. It’s always an amazing experience, and one of the coolest feelings anywhere when I’m in the backcountry and I see a bear – or even bear tracks. They’re just way cool. I never met Timothy, but I did read al ot of stuff by and about him – I can’t really say whether he respected the bears or not .. I do think he, like anyone, made some good and some bad decisions. But he lived his life doing what he wanted, and I do respect him for that. I’m not so sure that people can’t “make friends” with wild animals. Maybe not ‘friends’ like humans are friends, but I do think it’s possible to develop trust with an animal, even wild animals, and to respect one another. And, in some ways, probably both the human AND the animal get some benefit out of the relationship.